An inmate who escaped from a Sonoma County detention facility in July was arrested Tuesday in Las Vegas, the Sonoma County Sheriff’s Office said Friday. Zephyr Malik Carter was assigned to a work crew outside the North County Detention Facility north of Santa Rosa when he escaped on July 28. He was tracked to San Francisco and his picture was posted on the Northern California’s Most Wanted website, sheriff’s Sgt. Michael Raasch said. Authorities received a tip that Carter was seen in a Las Vegas hotel and he was found and arrested Tuesday evening without incident at a motel just off the Las Vegas Strip, Raasch said. He will be returned to Sonoma County to face new charges related to his escape, Raasch said. Carter was arrested April 5 for identity theft, credit card fraud and forgery-related charges, Raasch said. The Sonoma County Sheriff’s Office said he was one of six people involved in an identity theft and counterfeit credit card manufacturing ring. Carter posted bail and was released from the jail, but he failed to appear in court. 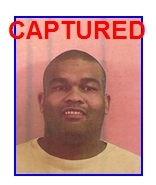 Carter was captured by the FBI’s San Francisco office and the U.S. Marshal’s Service Fugitive Task Force Team in May in Oakland. He had 57 fraudulent credit cards when he was arrested, Raasch said. Carter was sentenced in June to two years and eight months in prison but was ordered to serve his term in the Sonoma County jail, Raasch said. Carter then escaped the work crew outside the detention facility that houses less serious offenders.